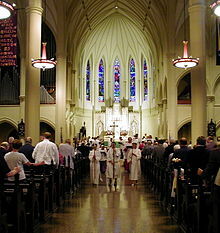 Interior o St. Mary's Episcopal Cathedral, Memphis, Tennessee wi a procession. A cathedral (French cathédrale frae Latin. cathedra, "seat" frae the Greek kathedra (καθέδρα), seat, stuil, furm, frae kata "doun" + hedra seat, base, chair) is a Christian kirk whlk conteens the seat o a beeshop, sicweys serrin as the central kirk o a diocese, conference, or episcopate. This page wis last eeditit on 19 Juin 2016, at 23:33.